I have no desire to run a restaurant, but I would love to cook gourmet meals every day. Because my real job doesn't afford me that luxury, once a week I create a new recipe and post it here. These are my own creations and they are copyrighted. If you'd like to share, please do so by linking back to this blog. Heat a cast iron pan over high heat. Coat bottom with olive oil. In the meantime, cut the shoulder in half; against the grain. Rub the spices into the shoulder, on all sides. Brown all sides of the pork in the pan (1-2 minutes each side). Set aside. Remove fat from pan. Add a little more olive oil and cook fennel and onion until aromatic (7-8 minutes). Add a pinch of salt, red pepper, garlic, and ginger and cook another 2-3 minutes. Add white wine and cook down until it's about half (7-9 minutes). Transfer to a stock pot or Dutch oven. Add the bay leaves and thyme and salt and pepper to taste. Fit the pork shoulder in the pan and pour in enough chicken stock to nearly cover the meat. Put lid on the plan and put in oven for one hour. After an hour, turn pork over and cook another hour with the lid still on. Then remove the lid, turn the pork one more time, and cook for another 45 minutes. Remove from oven and transfer to cutting board and tent with tin foil. Let rest for 15 minutes. While the meat is resting, pour some of the liquid from the pot into your cast iron pan. Heat on medium high until it begins to bubble. Add 1/8-1/4 C of flour and 1 T of unsalted butter. Whisk the flour in so there are no lumps and add salt and pepper to taste. 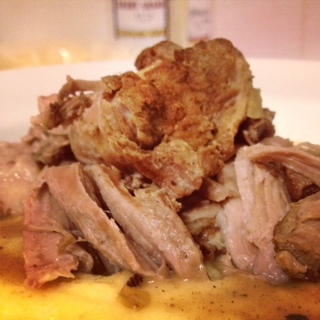 Serve with parmesan polenta on the bottom, the gravy on top, and then the pork on top of that. The pork will be so tender, it falls off so you won't need a knife to serve - or eat - it! * I make this and keep in my spice cupboard. One recipe lasts five or six uses. ** The butcher at the grocery store can remove the bone for you.